So how much pop was in the King of Pop's funeral? After the world-televised seating of family and famous friends, most of Michael Jackson's Sept. 3 funeral took place behind the closed gates of Forest Lawn Memorial Park in Glendale, Calif. The event's costs, however, were only made public yesterday, when court papers were released as lawyers continued to wrangle over other estate details in court. According to the papers, more than $1 million went into the event, including the solid bronze casket with 14-karat gold-plated handles and the party following the ceremony  all of which needed court approval for Michael Jackson's estate to cover the costs. That's a lot of This Is It ticket sales. The papers also show that sisters Janet and LaToya Jackson were owed reimbursements of $49,000 and $2,437, respectively, for fronting immediate funeral costs. As Katherine Jackson's lawyer states in the court papers, while the costs are "significant, they are entirely commensurate with the decedent's worldwide status as an entertainer and with the world's grief over his death." 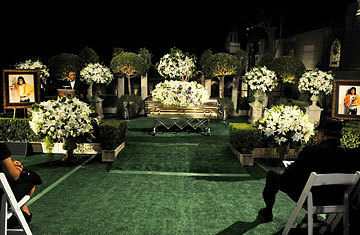 The post-funeral reception, attended by Jackson family members as well as producer music mogul Quincy Jones and the Rev. Al Sharpton, was held at nearby restaurant Villa Sorriso. It ran a tab of $21,455. The passed tray food, including tidbits like bruschetta, fruit skewers, beef satay and ratatouille, was one of the party's cheapest features at $4,200. The most expensive? The open bar. Instructions on the bill said the bar was to "notify host when $10,800 was met." Based on the final total, the guests hit that alcohol ceiling. Now that's a wake made for a King. See the last pictures taken of Michael Jackson.